Get your biggest ideas in front of small audiences quickly. With the D2200 interactive whiteboard, you can showcase presentations, videos and more on a 21.5-inch screen that's more convenient for small business settings or classrooms. Set up this office whiteboard up on your desk or mount it on a wall. Wherever it's used, you can share incredible images with 1920 x 1080 dpi resolution so every viewer sees every detail. The IWB D2200 is HDMI-ready, so there's no need for software, calibrations or IT support. Simply pair it with your PC, tablet, smartphone, USB flash drive* or other device** in any Windows® or Mac® environment. *Can open PDF and PowerPoint files in USB flash drive devices. Use the interactive touchscreen to add impromptu edits to your presentation, including handwritten notes, shapes, drawings and more with your fingertip. Navigate through your presentation and zoom in on images with the same swiping, pinching and flicking techniques you use on your personal mobile device. Take advantage of the built-in video camera and microphone to turn your interactive whiteboard into a videoconferencing device. Toggle between video-conference and interactive whiteboard modes with a single touch, and show your face along with your best ideas to leave a longer lasting impression with remote audiences. Make small group discussions more interactive. Multiple users can use the touchscreen to add annotations simultaneously. They can also download images or documents from their own personal mobile device and incorporate them into the presentation. Upload your own files with the RICOH Smart Device Connector app and print using our Universal Print Driver. 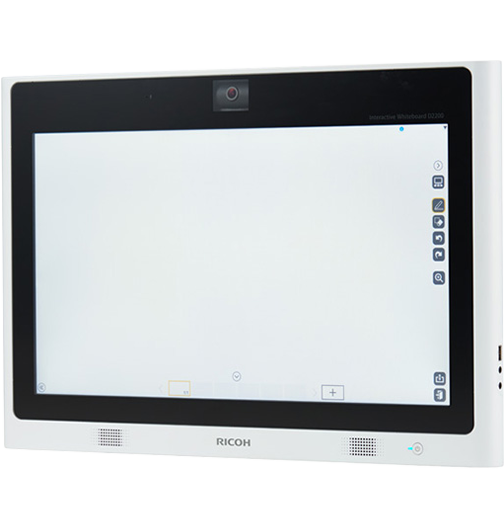 Share your presentation with up to 20 Ricoh interactive whiteboards or interactive business projection systems via the LAN or wireless network. When you add a remote license, up to 20 other guests can participate in the meeting from their own computer or mobile device. You won't lose any interactive features, but you can ditch the high travel costs. Save your presentation as a password-protected PDF on a shared network directory, USB drive or even on the board's solid-state drive. Then share it in moments via email. Users can add their own edits and save it as the latest revision, searchable by keywords for convenience. With the RICOH iPad® app***, you can even make edits from your personal mobile device to keep working while you're on the move. ***Remote license is required for collaboration with iPad. Protect your message by controlling who sees it. Use access codes for meeting participants. Delete your presentation automatically the moment you shut off the electronic whiteboard to keep other users and non-invitees from seeing your work. Take advantage of McAfee whitelist for even more protection from nefarious threats.